Oily sludge is difficult to reuse because it is mixture of waste solids, oil and water. If not treatment, Oily sludge is hazardous to environment, may contaminate the soil, water and air. The oily sludge can be from refinery, drilling waste or tank cleaning etc. From technology, if the oily sludge can be separated to oil, water and solids, the separated oil can be reused or resell, the separated water can be used for green or project. After well separation, the oily sludge can be effectively become useful material. GN Solids touch the first the oily sludge treatment project from Middle East. The client is professional oily sludge treatment engineer, and have large quantity of oily sludge from refinery in two sludge plant. The client is good at mechanical plan with chemical enhancement. After about 2 years discussion, we finally agree each other on the solution. Pls see more info about each part. Remark: if the solids particle size is less than hundred microns, this part can be bypassed. If there are some percentage big solids inside the oily sludge, it is better to use the HG dryer to separate the big solids. And the clean oily sludge can drop down to the catch tank. The HG dryer is equipped with spray line to clean the shaker screen to avoid oily sludge stick on the screen. The flocculent unit can coagulate the fine solids to big ones, and make it easy separation for decanter centrifuge. The user can also adjust the PH value of the oily sludge by adding acid solution or aqueous alkali. 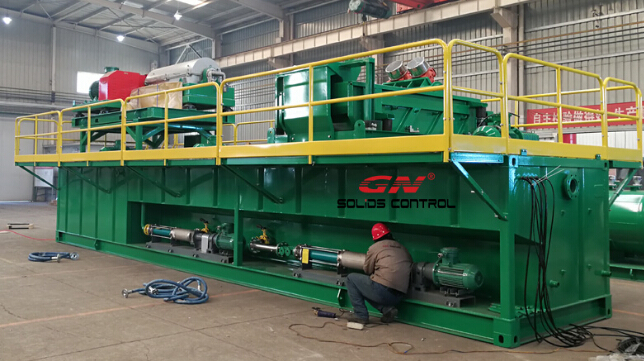 If you want to know more info, pls contact GN Solids Control.